The Fortnite Season 8 Week 7 cheat sheet has been released. The cheat sheet was released once the Fortnite season 8 week 7 challenges unlock on April 11, 2019 at 7:30 AM PDT / 10:30 AM EDT / 3:30 PM BST. The week 7 cheat sheet will help you complete this weeks challenges and earn battle stars towards the progression of your battle pass. As usual, the cheat sheet contains simple tips to help you complete all 7 of this weeks challenges – 4 battle pass challenges and 3 free challenges. This weeks challenges will give Fortnite players a few new objectives this week. The challenges encourage players to do damage while using zip-lines, visit pirate camps and loot chests at certain named locations. Most of the challenges are repeats of previous challenges, just with a small twist. By completing at least 4 of the 7 challenges in season 8 week 7 players will be rewarded with a bonus of 7,000 XP. 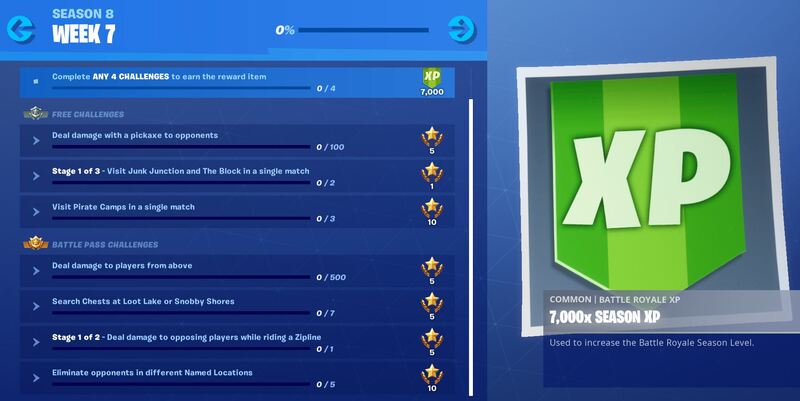 If you complete all 7 of the challenges you will be rewarded with the Discovery Challenge week 7 loading screen. Keep in mind to complete a challenge you will need to finish the game. Leaving before the game is over will reset your progression on whichever challenge you were working on. You can finish the game by being eliminated, or by taking home a victory royale.